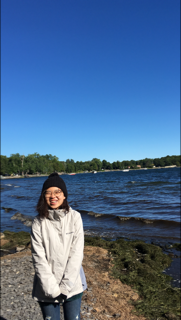 Yunzhi Liu comes from Beijing, China, and she is currently studying Classics at Middlebury College in Vermont, the US. 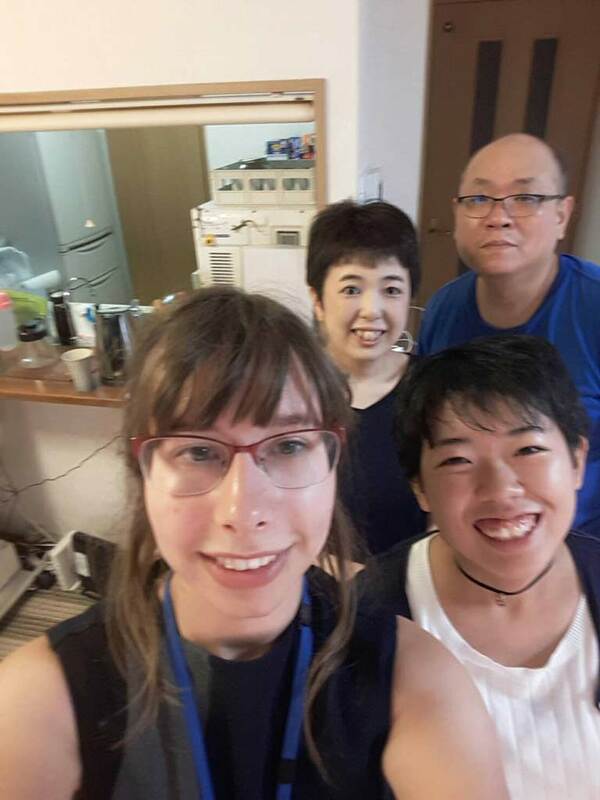 She first became a World Campus Japan participant in 2017, and the powerful experience she had interacting with the local communities inspired her to come back and learn more. She felt belong to the program community and appreciated the great friends she was able to make. As a counselor, she will be responsible for interpretation and translation, and she hopes to help the participants enjoy and gain a great deal from the program just like she did. 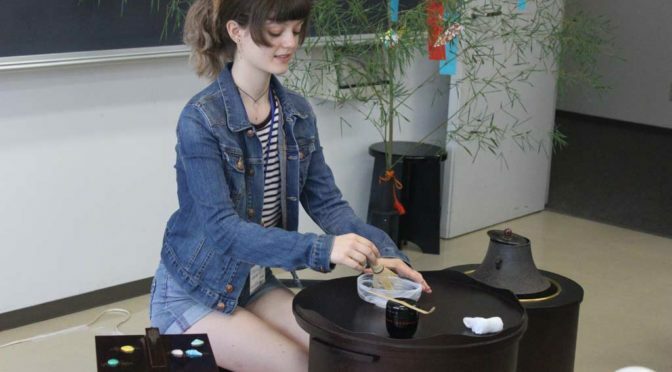 Her interest in Japanese customs, history, and religion can be traced back to when she first started learning the language at the age of 12, and she is now still minoring in Japanese Studies in university. She finds a community like World Campus important to her forming understandings of the country, on account of being able to learn about Japan not only through one’s own, but other cultural lenses as well. She also likes writing, reading, watching Japanese films and anime, and playing badminton. Nena Stritzel was born in Belgium. She studied journalism for four years and after her graduation she decided to learn Japanese and now she is a second year student Japanology at the University of Ghent. In her first year she got in contact with World Campus – Japan when Hiro Nishimura came to her University informing about the program. As soon as she heard the stories of her fellow students who went through the program, she knew she had to go too. It was her first time visiting Japan and she had the best experience ever. She believes World Campus is the best way to explore and to get to know Japan in his full glory. Definitely the experience with the different hostfamilies is something unforgetable. She is so happy that she met so many lovely new people that she got really close with. 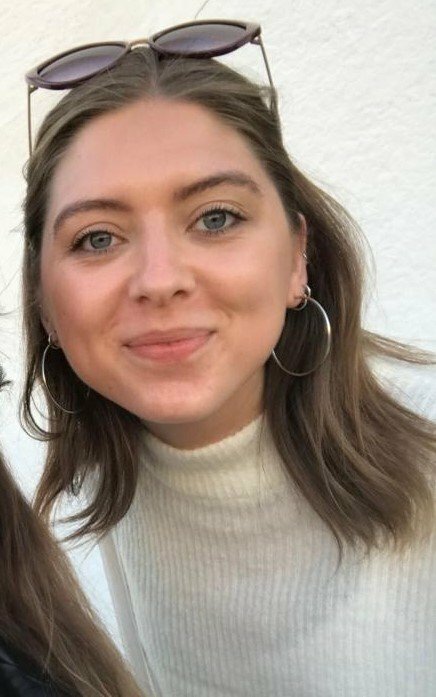 She finds it interesting to meet new people from all over the world, so she hopes to meet a lot of new people this summer and help them have the same unforgetable experience that she had in her summer. And of course that she will have a lot of fun together with them! She is looking forward to meeting you all. I woke up at about 7:30 this morning to eat a bowl of oatmeal with yogurt and grapes with my host mother, Tomi, and brother, Hotaru (A meal pretty typical for me in America). However, it would differ when I left with my mother to the Keisen University in rainy weather due to a typhoon approaching. We were told the day prior that this was an all-female Christian university where we would get to meet with the students, learn some history about their school, and discuss world topics. I have to admit, it was actually pretty fun! We had around six or seven students from the university who joined us during the day there and show us around. We first went to the chapel and learn the history of the school along with a beautiful piece played by an organ player at the school (I still can’t believe she said she spends up to eight hours practicing before a performance!) Afterwards, we went to the university’s library where they had a dedicated memorial to the bombing of Hiroshima and Nagasaki. 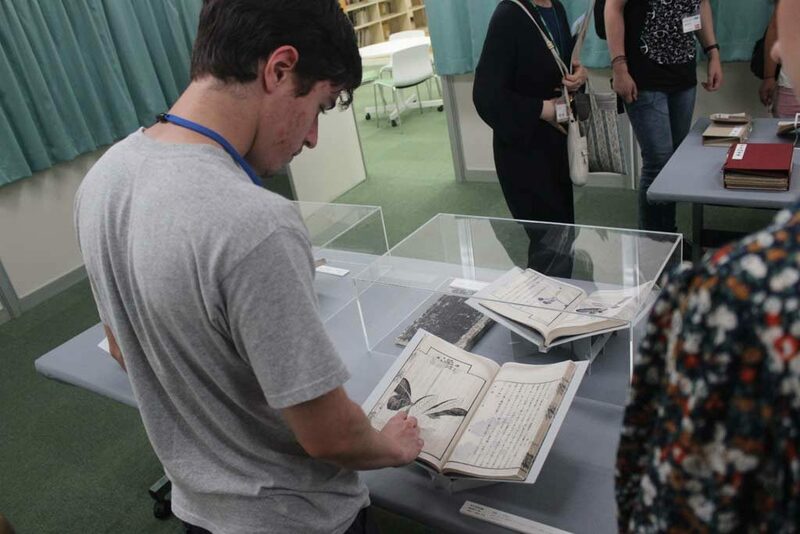 They kept many books and articles showcasing the first-hand experience the victims had. Even by the time it was 11:00, the rain was still trickling outside. That didn’t stop us from being shown the herb garden the university tends to. They even made herbal water from the garden for us to drink while we discussed world affairs with the students. Even though all of us in World Campus Japan comes from different countries, us and the students all had meaningful discussions on our views of immigration, global warming, taxes, and what it means to have world peace. I believe we ate lunch at around 12:00 in the university’s cafeteria with the other students. I just ordered a bowl of miso soup. After getting to talk to the students a bit more, we headed to the Nagayama Community Center where we would be showing Tama what it means to be a part of World Campus Japan. For about two and a half hours, World Campus members from their respective countries made a presentation from the day before showing the great things from their countries that they wanted others to know about. Locals from Tama were invited to come to the center to view our presentations and learn more about all of our countries. With my partner, Sydney, we wanted to show how large the United States truly is and how diverse the culture is when it comes to its food, climate, and sports. We were also chosen as one of the four countries to do a dance for the locals (The others being Finland, Netherlands, and Norway). This turned out to be a cultural lesson for me too as we decided to do the chicken dance which I haven’t done in years! Thankfully, the dance is fairly simple. Unfortunately, Sydney had become ill over the past few days and had to rest today. In other words, I and two of the Japanese students got on stage in the spotlight and taught an audience of about 100 adults and children how to shake their feathers and dance like a chicken (It looks better in person, I promise). Although the event was long, I got to talk with so many locals and learn more about their life and their experience with America. Even better, I felt good being able to share my culture with so many locals. I can just feel that all of us today made an impact on the community with the event. Once we wrapped up our end-of-the-day discussion at 17:00, my mother and brother came to pick me up. I got to meet some of my brother’s friends (Who all happen to be 7 years old) and we went back to our apartment. We ate a kind of curry with mushrooms and rice, beef, grapes, and corn. My brother was dying to play the Wii with me after I promised to play earlier. If there’s one thing my brother has taught me, it’s that I should really try to get better at skiing in Mario & Sonic at the Olympic Games. I still have no clue how he had more than double my score. We finished the night with my dad getting home and joining in on the game. I’m going to bed earlier since tomorrow is the Arigato Event and I want to have enough energy to dance for my host family. I had never done a presentation like the one today before, but I have to say that I’m glad I did. Maybe we even encouraged people to apply for World Campus to Norway and Finland! When I woke up today, I felt like laying in a sauna. I think it was about 40 degrees Celsius in my room, although it was only 7 am. Atsui desu! In the kitchen, there was already a nice breakfast waiting for me. My host Mom made it for me. She is so kind. It is always fun to talk to her; she hardly speaks English and I don’t understand Japanese, so we lead our conversations with a lot of gestures and simple words; the best way to get to know a new language, I guess. Later, we drove to Chuo Gakuin University. We were going to experience a traditional tea ceremony, chadō, and discover Japanese calligraphy, shodō. After everyone from the group had arrived, we took a seat in a large room where the students and teachers received us affectionately; they were happy to meet us. In front of us, a young woman, wearing a Yukata, made one cup of matcha tea. During the procedure, she used different utensils and every single movement was perfectly practiced. She seemed to be in her own world; looking at her was calming. I didn’t expect it to be so accurate and it was really admirable. After that, we could try it. Somehow, I was a bit nervous because even the cups are held in a special way! But the students helped us. We also got to know origami and folded some pretty cranes. While eating lunch, we became acquainted with the university students and their teachers. It was really interesting to learn about the way they live in Japan and about their studies. 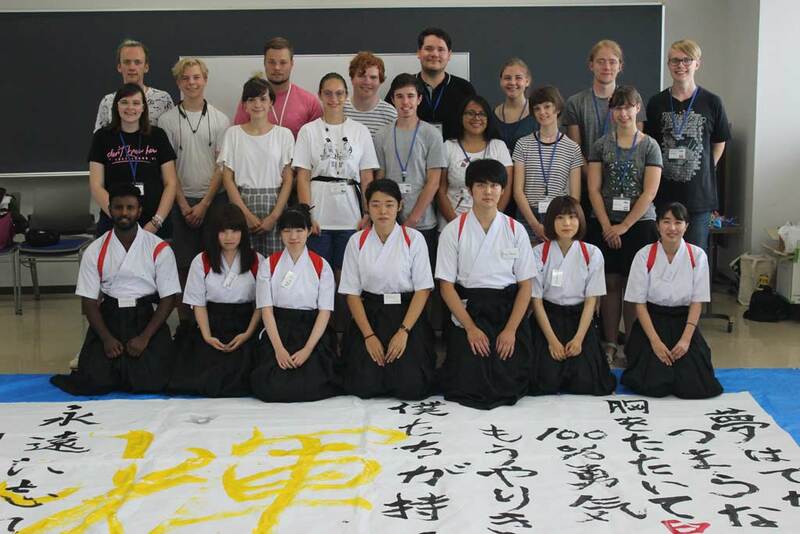 After lunch, the shodō students showed us a presentation where they were writing on a huge piece of paper. It nearly looked like a dance which was quite impressive. We were involved too and could write on a fan. Shodō is a peaceful and comforting activity; I think everyone had fun! Later on, we interacted with the students while playing games and drinking tea, which was actually Cola. And this is, in my opinion, one of the best things of World Campus Japan: you meet people from all over the world. You make new friends and enjoy great moments with them! During my short time here in Japan, I got to know so many nice people; it‘s amazing! I spent the rest of the day with my host family. In the evening, we watched anime together, exchanged knowledge about our cultures and laughed a lot! That day, I made numerous great experiences. And imagine, it was only one day out of 3 weeks, where I‘ll discover this amazing country.